Theodore Roosevelt National Park in North Dakota. Buffalo herd at Theodore Roosevelt National Park. well-known around the country for its breathtaking scenery and fantastic wildlife viewing. 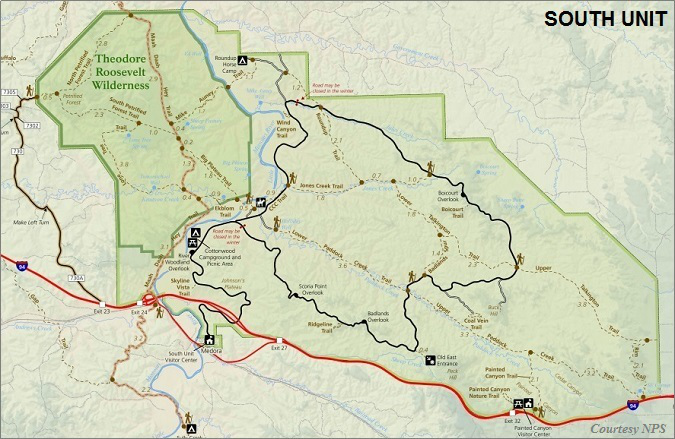 Separated into three geographical areas- the main South Unit, the North Unit and the Elkhorn Ranch Unit. The South Unit is the largest and most visited of the three units mainly because it rests along Interstate 94 at the gateway town of Medora, North Dakota. The North Unit is found 80 miles north of the South Unit on U.S. Highway 85 near Watford City. The Elkhorn Ranch Unit rests between the North and South Units, approximately 20 miles to the west of U.S. Highway 85 on a dirt road. 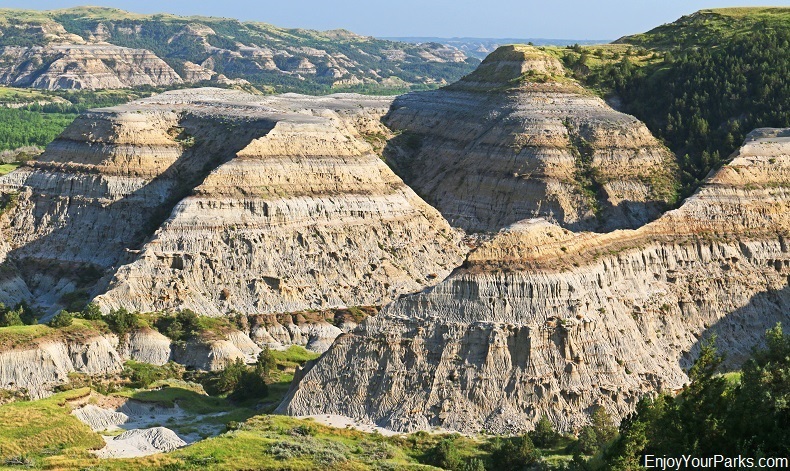 Theodore Roosevelt National Park provides spectacular badlands scenery as well as amazing wildlife viewing, camping and hiking opportunities. The Little Missouri River flows through all three units of Theodore National Park, which provides a haven for wildlife as well as the necessary erosion to geologically create through the ages some of the most spectacular badlands landscape found anywhere in North America. Wild stallion at Theodore Roosevelt National Park. 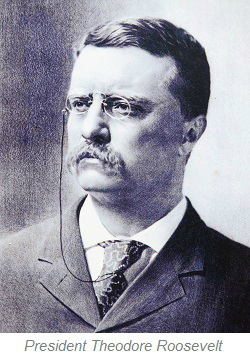 Theodore Roosevelt came to North Dakota for the first time as a young man in 1883 to hunt bison (buffalo). Coming from New York, Theodore Roosevelt instantly fell in love with the area and what he called the "Perfect Freedom", and not only did it change his life forever, but also the nation. During his brief first visit, he invested $14,000 in what was known as the Maltese Cross Ranch, which was located about 7 miles south of the town of Medora. 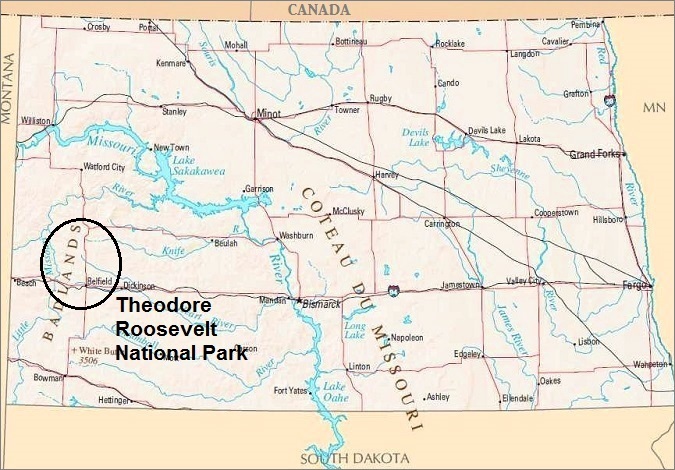 Then in the summer of 1884, Theodore Roosevelt returned to North Dakota following the death of his mother and his wife on Valentines Day, February 14, 1884. Needing time to heal and looking for solitude, he started another ranch 35 miles north of Medora, and called it the Elkhorn Ranch. During this time, Theodore Roosevelt wrote three major works, entitled, "The Wilderness Hunter", "Hunting Trips of a Ranchman" and Ranch Life and the Hunting Trail". And after losing much of his cattle during the harsh winter of 1886-1887, and all of his adventures he experienced there, these things proved to be extremely influential in his pursuit of conservation policies during his 8 years as President of the United States. 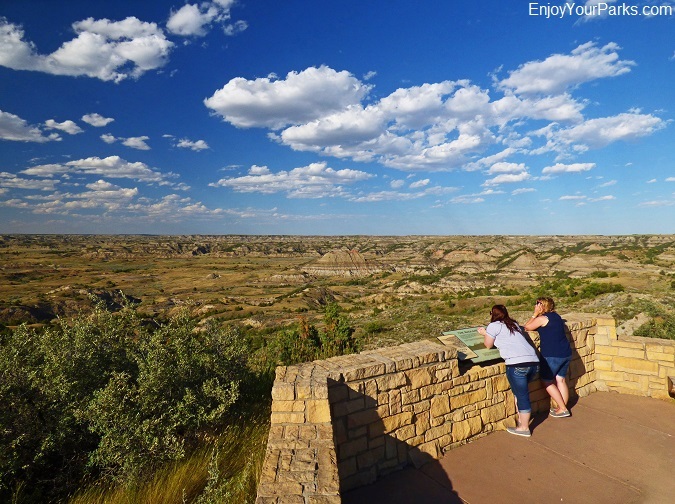 Visitors enjoying the view from the Painted Canyon Overlook at Theodore Roosevelt National Park. 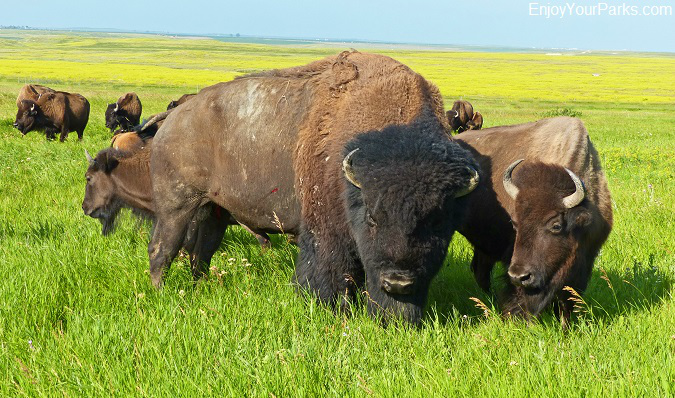 Buffalo, Feral Horses, Prairie Dogs and Much More! well as a gorgeous herd of feral horses. Buffalo can be found throughout the park...in both the north and south units, and are among the most popular animals in Theodore Roosevelt National Park. As you drive the loop highway around the South Unit, more than likely you'll see these spectacular animals up close and personal. And while driving the South Unit Loop Road, keep an eye out for the several herds of feral horses. 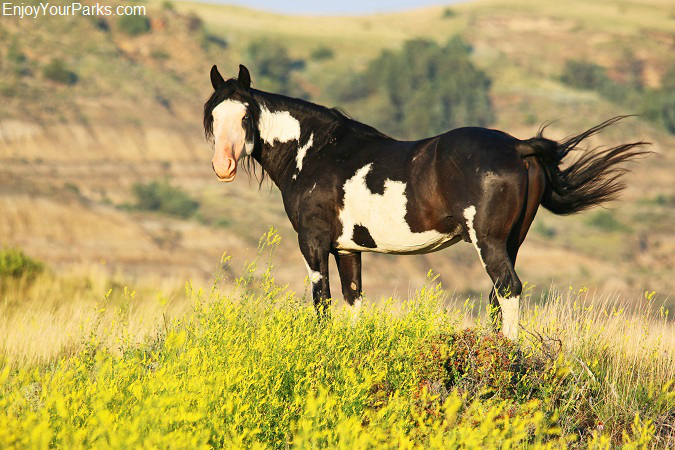 These gorgeous wild horses can be found anywhere, so always have your camera ready. And throughout Theodore Roosevelt National Park, there are many "prairie dog towns" where you'll see these fun-to-watch animals as they scurry around the prairie "doing their thing", such as standing straight up on their toes with their heads straight up in the air and front legs fully extended as they "call". 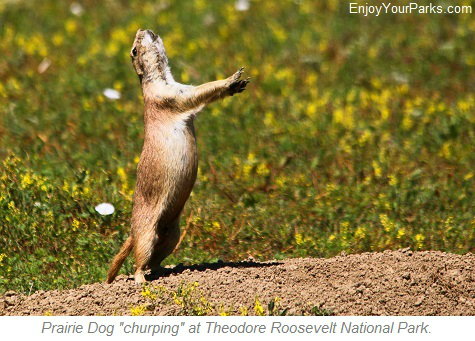 This loud chirping sound alerts other prairie dogs in the area that there is possible danger. 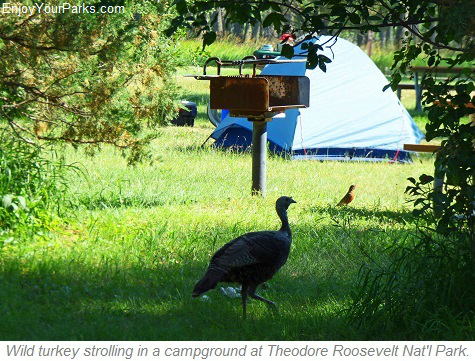 Other animals found in Theodore Roosevelt National Park are mountain lions, elk, bighorn sheep, mule deer, whitetailed deer, coyotes and over 185 species of birds that include sharp-tailed grouse, Western meadowlark, golden eagles and wild turkeys. Wild horses at Theodore Roosevelt National Park. Buffalo at Theodore Roosevelt National Park. 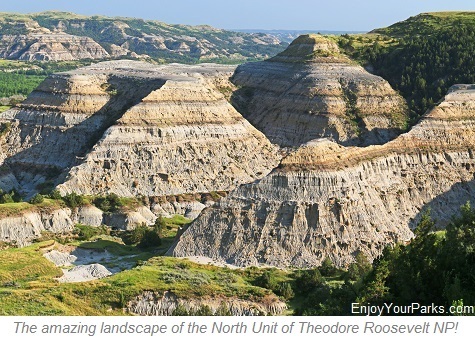 The South Unit is the most popular unit in Theodore Roosevelt National Park for two reasons. 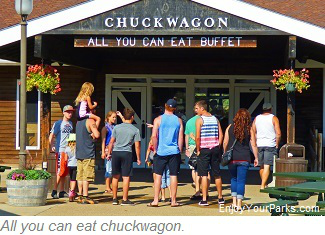 One reason is the fact that it's right off Interstate 94 and is next to the charming tourist town of Medora North Dakota. The other reason is the fact that there is a wonderful loop roadway that is nicely paved that takes visitors through incredibly scenic badlands that are teeming with buffalo, feral horses and many other species of wildlife. There are also fantastic hiking trails that range from less than a mile long, to over 11 miles in length. If you only had time for one unit, we highly recommend spending time in the South Unit...It is really an amazing place to discover and explore, and the loop road provides wonderful access to fantastic vistas, landscape and wildlife! 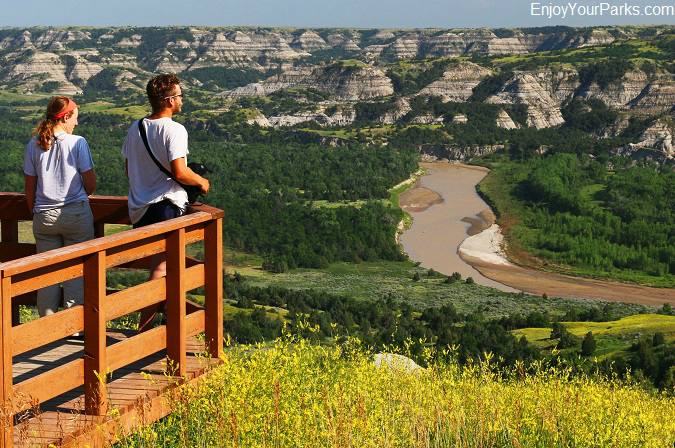 Visitors enjoying the incredible beauty of the South Unit at Theodore Roosevelt National Park. 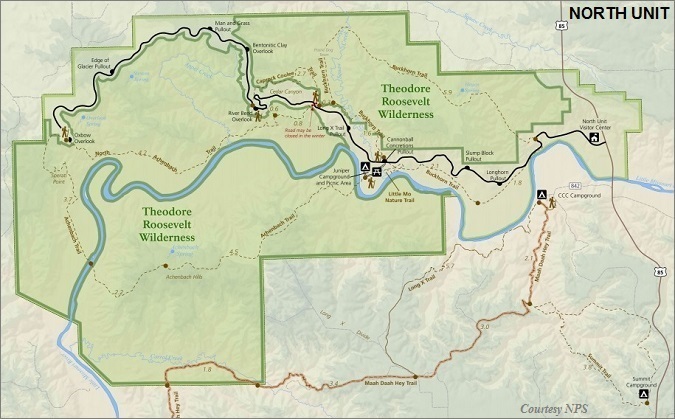 South Unit Map, Theodore Roosevelt National Park in North Dakota. 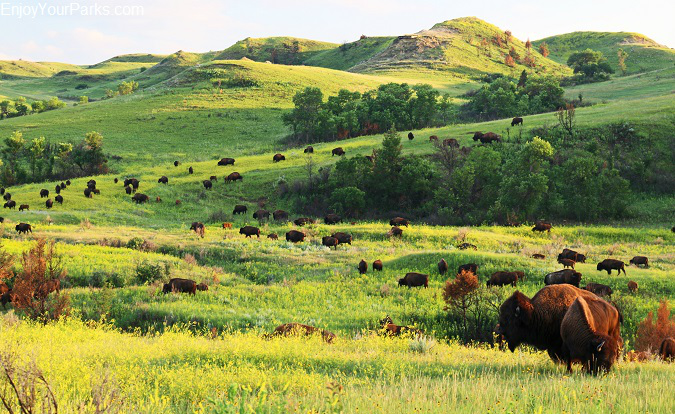 Buffalo herd at the South Unit of Theodore Roosevelt National Park in North Dakota. Located about 80 miles north of the South Unit along U.S. Highway 85, the North Unit is known for its deep canyons and rugged bluffs. These massive canyons are quite dramatic and awe-inspiring, and there are several overlooks that provide visitors with stunning views of these canyons as well as the Little Missouri River. There is also some amazing wildlife in the North Unit as well, including buffalo and bighorn sheep. 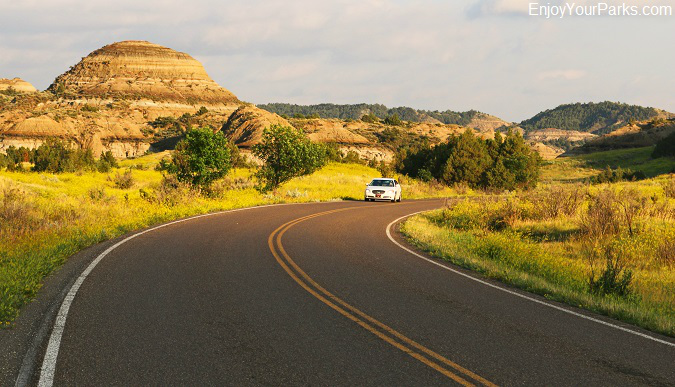 If you have the time, we highly recommend that you take the time and effort to drive through the North Unit of Theodore Roosevelt National Park. Its grandeur, it's vastness and its beauty is well worth the time...We are confident that you'll be glad you made the trip up to the North Unit...It will be one of the highlights of your North Dakota vacation. 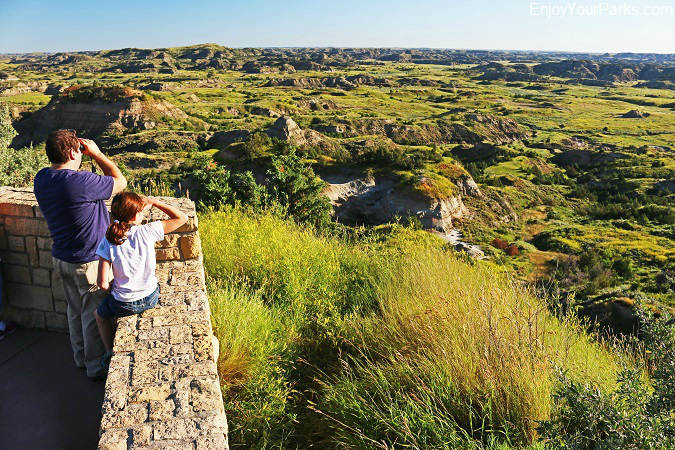 The North Unit provides spectacular vistas of the North Dakota Badlands and the Little Missouri River. Located approximately mid-way between the South and North Units, the smaller Elkhorn Ranch Unit is located about 20 miles west of U.S. Highway 85 on a dirt road. The Elkhorn Ranch was built by Theodore Roosevelt in 1884, and was where the young Theodore Roosevelt spent much time at. 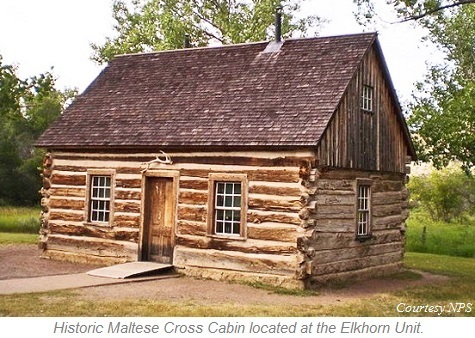 The historic Maltese Cross Cabin, which was built in 1883 on the Maltese Cross Ranch (south of Medora) and was part of Theodore Roosevelt's first ranch that he purchased in 1883, was relocated to the Elkhorn Ranch years later for visitors to enjoy and explore. His original rocking chair is still found in this historic cabin. If you're a history buff, or a least sort of interested in classic Western history, we feel it's worth the effort spending time at the Elkhorn Ranch Unit in Theodore Roosevelt National Park. One of the many short trails along the South Unit Loop Road that take visitors to spectacular vistas. 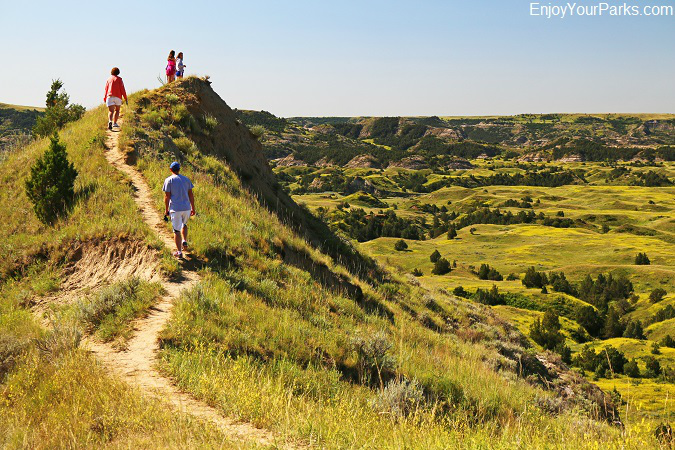 There are several outstanding hiking trails found throughout Theodore National Park that take visitors into the scenic badlands. Some trails, such as the Skyline Vista, only take about 10 minutes but provide an exceptional vista of the North Dakota Badlands, to the 10.3 mile Petrified Forest Loop. All of these trails are wonderful and each trail offers something quite unique and different compared to the others. We enjoyed them all very much...so you can't go wrong in choosing which ones to undertake. all of the individual sites are available on a first-come, first served basis. The Cottonwood Campground is located in the South Unit, where half of the campsites are reservable, and the other half are on a first-come, first served basis. There is also the Roundup Group Horse Campground in the South Unit, which is designated only for larger groups with horses. During the summer months there is partial shade provided by the large cottonwood trees found in these campgrounds. Also during the summer there are many potable water spigots found in both campgrounds, along with vault toilets, however there are no hookups available in either of the two campgrounds. The campsites in both the Cottonwood Campground and the Juniper Campground sites vary in configuration. Some are walk-in, some are back-in and some are pull-thru sites. Each campsite is limited to 6 people or one family, and there is a two vehicle limit per site. There are raised grills provided for campers to cook with or enjoy a campfire. Both the Juniper Campground and the Cottonwood Campground have one group site for groups of six or more people, and are available via reservation only. The Roundup Group Horse Campground, found in the South Unit, that are for groups that are camping with horses and is also reservation only. The South Unit provides guided horseback rides that are quite popular among visitors. 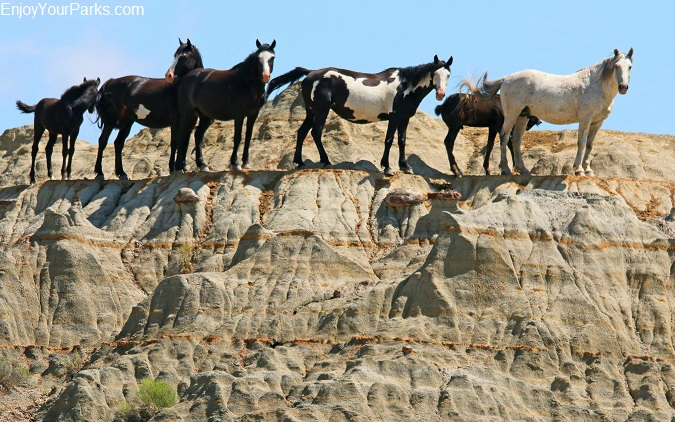 Even if you've never been on a horse before, the friendly, professional and courteous guides will show you all you need to know to enjoy a trail ride in the gorgeous badlands of Theodore Roosevelt National Park. These horses are extremely well trained and very gentle...and the guides are with you every step of the way if you have any questions or concerns. 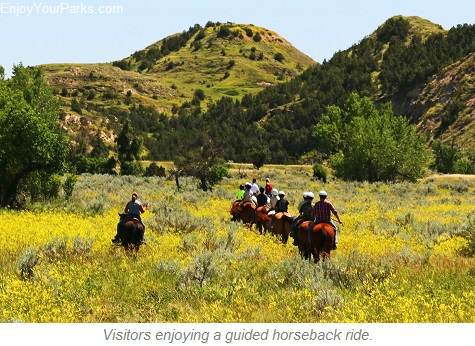 If you're interested in taking one of these guided horseback rides, talk to a ranger at the Theodore Roosevelt National Park Visitor Center that is located at the South Unit Entrance at Medora. 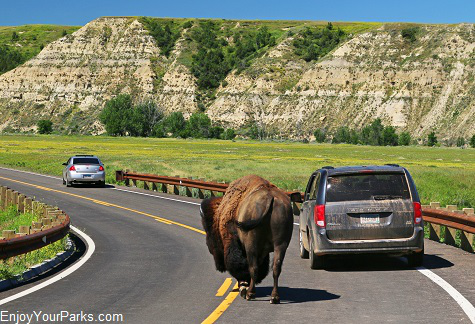 Visitors enjoying the drive along the loop road of the South Unit at Theodore Roosevelt National Park. 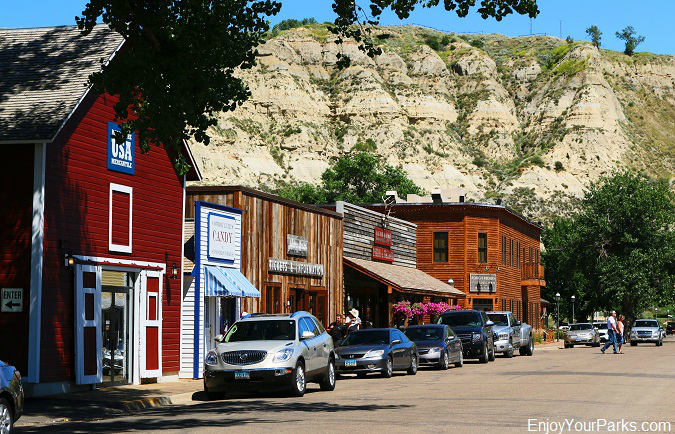 along Interstate 94, Medora is a charming "cowboy" town, with amazing shopping, dining and lodging opportunities, as is also the home of the legendary Medora Musical. 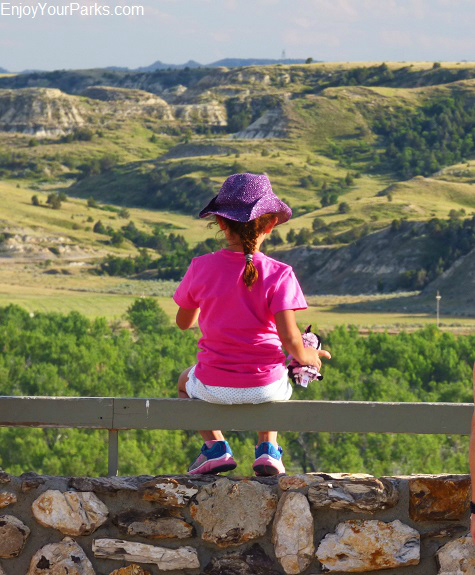 The Medora Musical is a favorite among visitors and locals alike, and a trip to Theodore Roosevelt National Park wouldn't be complete without enjoying the Medora Musical. 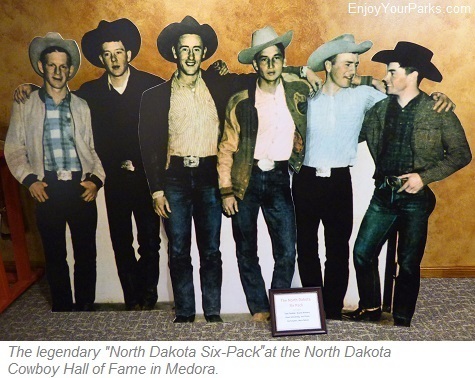 There is also the world-class North Dakota Cowboy Hall of Fame located in Medora, which we also highly recommend that you spend time in during your stay here. 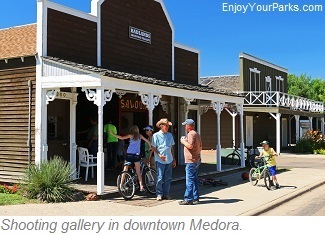 The history of Medora in and of itself is quite fascinating, and there are several museums and interpretive displays on what led to the development of the incredible town of historic Medora. 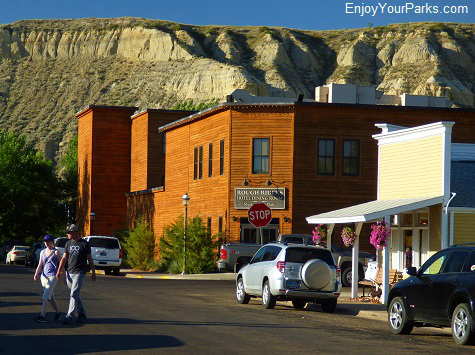 So it you're interested in history, Medora, North Dakota will not only be fun to visit, but will be extremely fascinating as well! 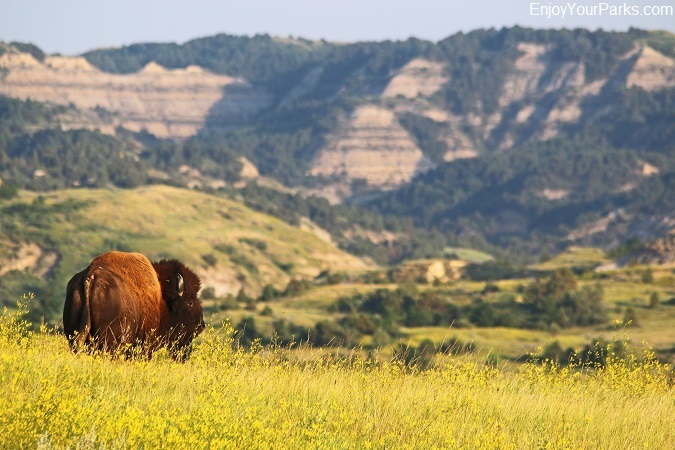 Medora, North Dakota is the "Gateway to Theodore Roosevelt National Park", and is one of the most enjoyable cowboy tourist towns you'll ever visit! 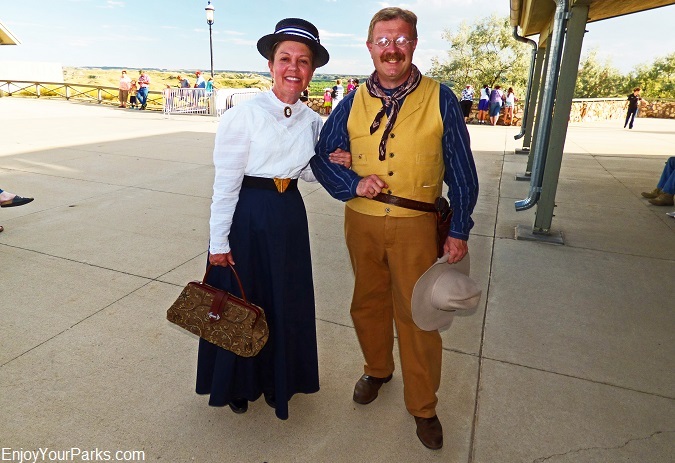 You might even get to meet President Theodore Roosevelt and his wife Edith on the streets of Medora! 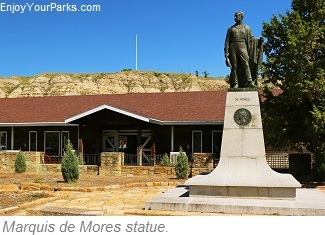 Medora was founded in 1883 by a French nobleman by the name of Marquis de Mores, where the town of Medora was named after his wife. Marquis de Mores' goal was to ship refrigerated meat to Chicago along the Northern Pacific Railway, which never came to full fruition...as far as what he had expected of this business venture. 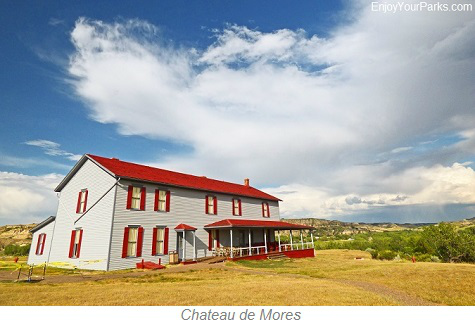 During the de Mores "hay-day" at Medora and while their dreams were still big, Marquis de Mores built a large meat packing plant, as well as a gorgeous chateau, which still stands today and is known as the Chateau de Mores. This elegant home is now a fascinating museum and is very much worth your time going through. There is also a wonderful interpretive center that further tells the fascinating Marquis de Mores' story. 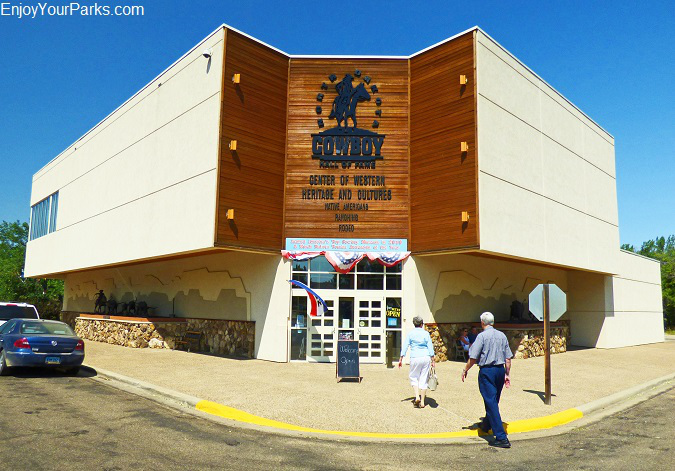 The North Dakota Cowboy Hall of Fame is a world-class museum located in Medora North Dakota. that is if you and your family are interested in genuine cowboy history and the history of the most famous cowboys in the great state of North Dakota. The displays are world-class, and you will get an incredible understanding of the deep and proud cowboy roots that grow very deep in this prairie state. You'll be so very glad you visited this remarkable North Dakota Treasure. The Medora Musical is without question one of the top attractions in North Dakota, and we highly recommend attending one of these incredibly entertaining productions. Located on the outskirts of Medora, the outdoor stage is nestled literally in the gorgeous badlands, with the background being a stunning view of classic badlands bluffs and grassland. This gorgeous outdoor theater is the perfect setting for evening as the show begins and the sun begins to set. 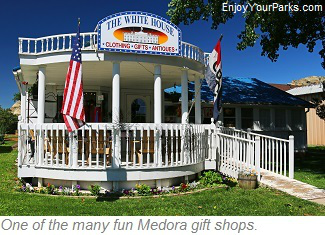 Also located at the Medora Musical is a wonderful gift shop that not only has great souvenirs, but it also serves as a history museum that tells the story of the Medora Musical. 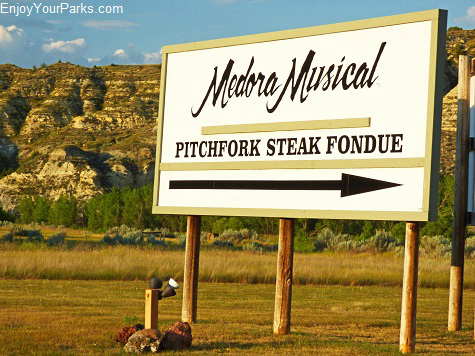 And don't forget the Medora Pitchfork Steak Fondue feast that is world-renowned that is served prior to the seating for the Medora Musical. 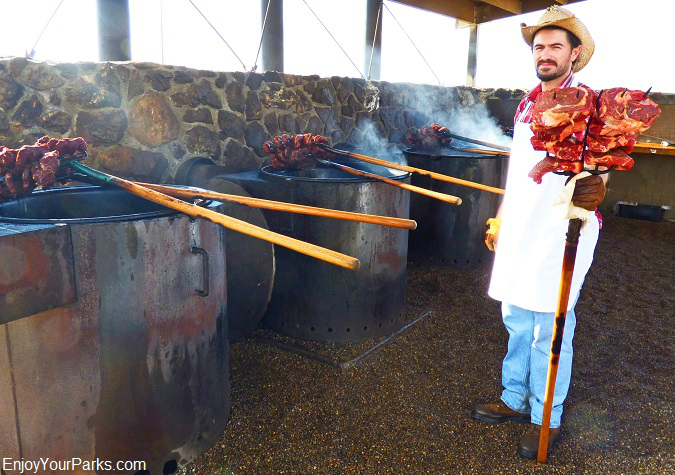 The legendary Pitchfork Steak Fondue at the Medora Musical. 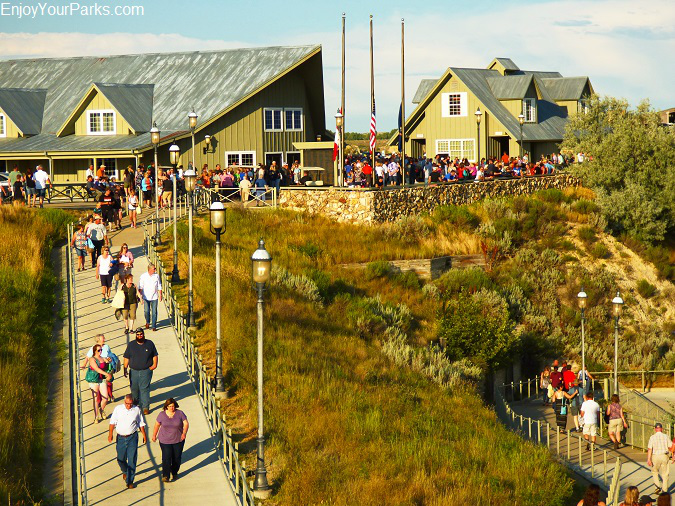 Visitors heading down to the outdoor theater to watch the world-renowned Medora Musical.